Holes in walls of 3D prints + tips for water-tight prints? Posted April 16 · Holes in walls of 3D prints + tips for water-tight prints? I am having some issues with prints using an Ultimaker 3. In the last few months I have began to notice that my prints are not as consistent in their quality and that a majority of them have holes in the walls. We use Ultimaker PLA in primarily black but also in other colors, and this issue seems to be consistent across the different colors and even with brand new spools. I have attached an image to give you an idea of the issue. I have also been reading some other posts that suggest this may be due to filament retraction when hopping, such that when it starts to print a new layer there is a lack of filament in the tip to start printing. Any relevance for this here? Additionally, I was wondering if anyone had suggestions or can lead me in the right direction on how to obtain high-quality water-tight prints. 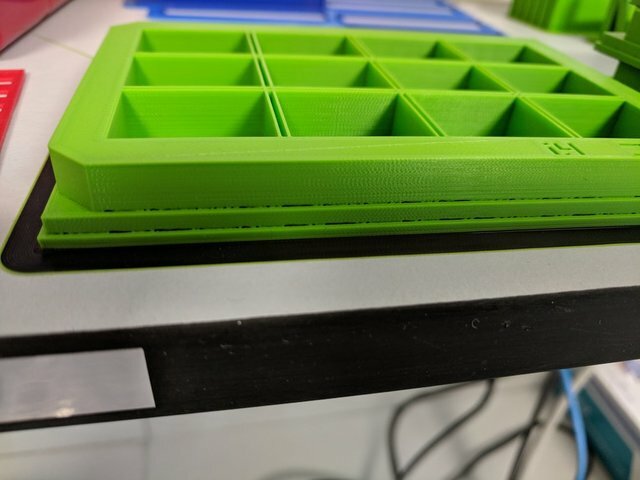 We are a cancer biology lab and print a variety of models for culturing cells and have recently been having issues with some of our prints leaking, or with the liquid media being absorbed into the meshwork of the prints. We have only used PLA and typically print using the extra fine profile in Cura. Any tips on materials or printer settings that could help in printing more "solid" and water-tight models that could help alleviate any of these issues would be greatly appreciated. Posted April 17 · Holes in walls of 3D prints + tips for water-tight prints? I usually print my medical models with 100% infill, which by nature very much reduces the possibilities of holes and leaks, althoug of course there are always thin "canals" of entrapped air in-between the extruded sausages, that are not filled. You can not avoid this. Printing slow also helps, and with enough extrusion: better a little bit over- than underextrusion. Also, user cloakfiend's acetone smoothing works very well: this tends to fill tiny gaps. Search for acetone smoothing on this forum. Further options: spraying a thick varnisch? Or dipping the model in it? However, for cell cultures, I would rather try to find commercial injection moulded containers in PP or PE (polypropylene, polyethylene): these repell water, and are chemically quite resistant. Or some other injection moulded containers that can be autoclaved. I wouldn't like the idea of cells, bacteria and chemicals getting into the little holes in the plastic of 3D-printed models, and contaminating everything. If not commercially available, and you need enough copies of the exact same part (let's say a few thousand), it is worth looking into custom small-scale injection moulding via prototyping companies like Shapeways. They can make injection moulds in aluminum, for up to 10 000 pieces, and run the production. Might be way cheaper than 3D-printing. You make the design (according to injection moulding rules, thus with draft and equal wall thicknesses), you make a few 3D-prints to verify if it works well (very important), and then send the design online to them and they do the rest.